Account Manager Amy Lenning decided plant care was her calling after taking a horticulture class as an elective at Iowa State University (ISU). 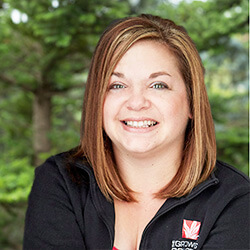 Graduating with a Bachelor of Science degree in horticulture from ISU, Amy has worked in the green industry since 1999. Before moving up the ladder in sales and account management at The Growing Concern, a division of Wright Outdoor Solutions, Amy worked as a plant technician, learning how to properly care for and maintain all plant types. She enjoys working with clients to get the results they want in a timely fashion, which stems from her passion for high-quality customer service. Amy finds that one of the most exciting aspects of her job is working with plants to create a new look for a client. At home, Amy enjoys using hostas; at work, a variety of dracaenas.